In addition to being a valuable research tool, used by entomologists and mosquito control agencies worldwide for trapping and surveillance purposes, mosquito traps are now recognized as an important device homeowners can use in their fight to help reduce mosquitoes and the risk from the diseases they carry. Humans and animals expel CO2 with every breath. Female mosquitoes have nerve cells called cpA neurons that have a receptor to detect Carbon Dioxide. This allows them to sense the plumes of air we exhale in order to hunt us down. Not surprisingly Carbon Dioxide or CO2 has been used in commercial mosquito traps since the 1990’s. However it’s important to note that CO2 on its own is not effective against all species of mosquitoes – and there are over 3,500 of them. Researchers at the NIH found that mosquitoes are still attracted to human skin even in the absence of carbon dioxide. Light as an attractant in traps is most effective for mosquitoes that are active at night. Most Culex and Anopheles mosquitoes bite at night whereas Aedes mosquitoes tend to feed in the day or early evening. The very earliest traps, the New Jersey and CDC light traps made use of mosquitoes’ attraction to light. 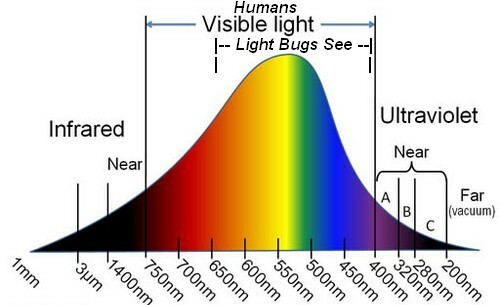 However insects do see things differently to us humans and light only becomes visible to them around the ultraviolet part of the color spectrum and ends at yellow light. Colored LED’s are attractive to mosquitoes and apparently each mosquito species has its favorite color (Burkett et al. 1998). Aedes and Culex preferring blue light. Mosquitoes use their keen sense of smell to detect and track you from a very long distance based on the odor plumes you give off. Every time we breathe out, we release chemicals like lactic acid and Octenol, that combined with CO2, forms our very own unique CO2 cocktail. This combination of scents is what clues mosquitoes that there is a human target nearby. However different mosquito species respond in different ways and there are so many variations in their behaviors and in the things that attract and repel them. The use of Octenol lures in traps can significantly increase catch and kill rates for some species. Other species, however may not be attracted so experimentation is needed to work out the best method. Mosquitoes use infrared light to hone in on our body’s heat. As mosquitoes draw close to their target (10 feet) the extremely sensitive thermal receptors on the tip of their antennae are able to detect the warmth of your body (think thermal imaging and the alien in the movie ‘Predator’). The range of these receptors is known to increase threefold when the humidity is high. Mega-Catch™ Ultra and Premier XC traps incorporate an adjustable 5 stage heating element with integrated heat mode which allows the system to run slightly warmer, making the trap more attractive to Aedes species mosquitoes. Catching mosquitoes it a bit like fishing and just like fish, mosquitoes move around throughout the season and their breeding sites vary. Most mosquito species avoid direct sunlight and wind so make sure your trap is placed somewhere shaded and sheltered; preferably amongst bushes or shrubs. Mosquitoes love water too, so check out for any damp wetland areas on your property. You may need to experiment with different locations to determine the most successful placement for your trap. Asian Tiger mosquitoes are notoriously difficult to control; they are opportunistic biters that bite as often during broad daylight as they will at dusk. In a study published by PLOS One it reported that trap placement significantly affected the number of Asian tiger mosquitoes captured, with catch rates in shade or partial shade over three times higher than those in areas exposed to the sun. While a mosquito trap will begin to catch immediately there’s any mosquitoes around, it may take anywhere between 6-8 weeks of continuous use. It typically takes that amount of time to kill enough female mosquitoes to make a population collapse. So when you first set up your trap we recommend that you run it 24/7, after that you can then operate the trap (with a plug in timer) during periods of maximum mosquito activity. Most mosquito species bite in the evening and early morning. Each female mosquito can lay up to 300 eggs at a time and repeat this cycle up to 10 times in her lifetime – that’s 3000 potential offspring. So one word – persevere!